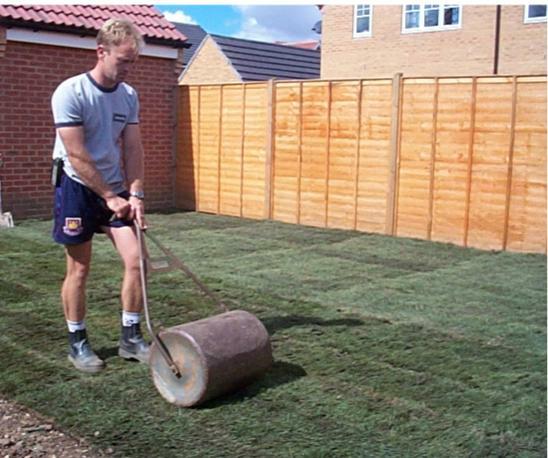 Laying turf - a day's job in most cases. 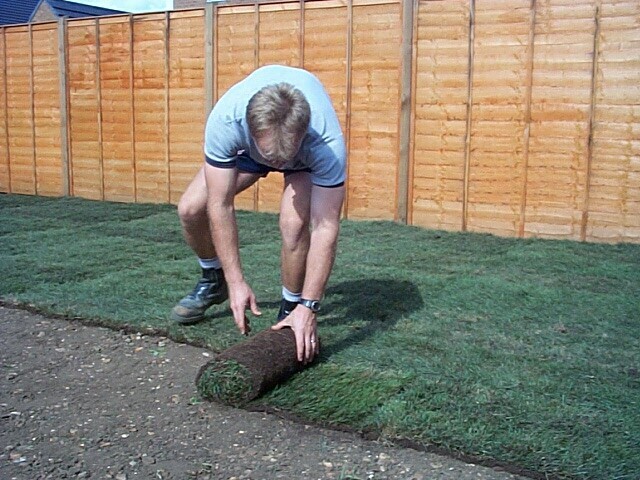 If you have a large area, or want to split the job up, spend one day preparing the surface and the second day laying the turf. 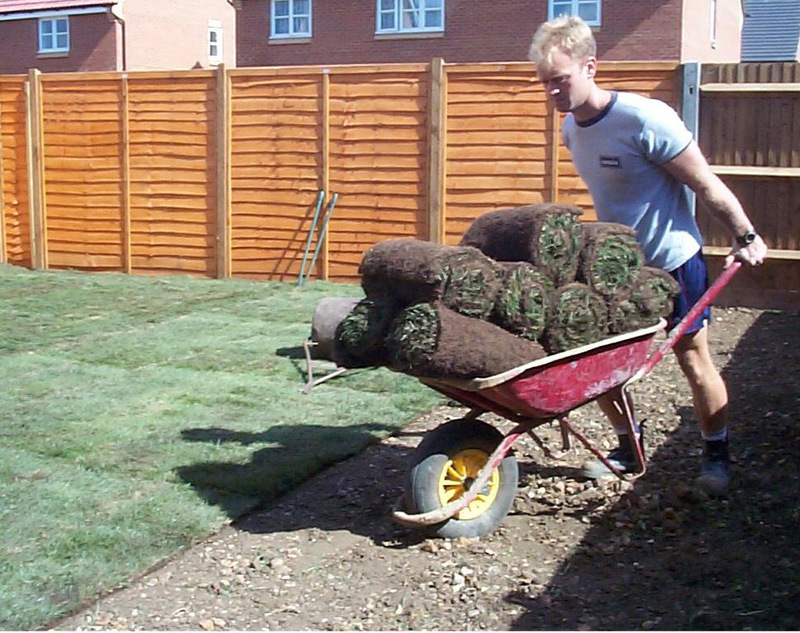 Turf is delivered in rolls, it is ideally lifted the same morning it is delivered and should be laid the same day. Turves can be cut easily with a half-moon edgder or even a large kitchen knife. Use them whole wherever possible however with few cuts. 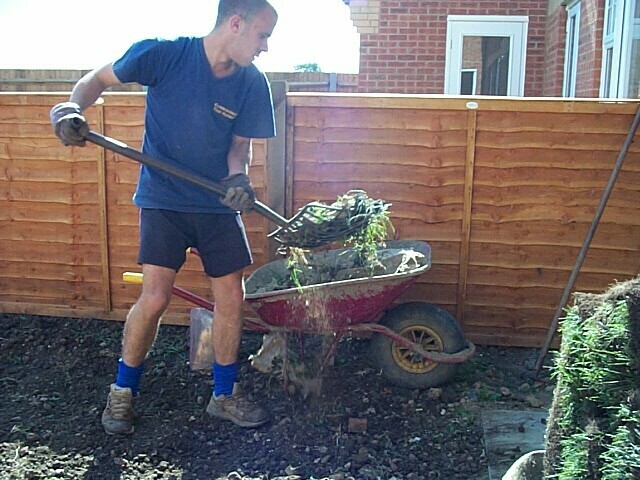 Remove large stones, weeds and other debris. Rotavate to loosen soil up, rake and again remove weeds, stones etc. Move soil about to level the site if necessary. Rake smooth. 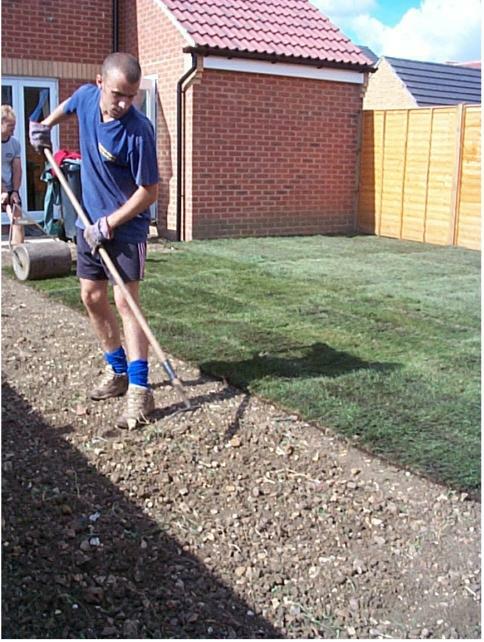 Firm soil down, shuffle over the ground with both feet together, make sure the whole area has been compacted this way. A fertiliser can be applied at this point if desired. A general one such as Gromore or blood, fish and bone. Make sure you rake it in well to the soil before the turves are laid, then water well and leave overnight before laying turves if possible. Water turves to help settle them down, give a really good soak. Stay off the grass for at least two weeks, longer if possible. Water well every 2-3 days during dry spells. Winter - Avoid frosty days, in fact you probably won't get it delivered as the turf merchants won't lift it then. Growth is very slow and you'll need to stay off it for much longer than the usual 2 weeks - how long? - depends on the temperature, if it's below 5C (41F) then there is no growth at all and those days don't count. I'd say about 2 months to be safe which doesn't matter probably if you don't have pets, but does if you do. Spring - A good time, early spring is better than late spring. Watch out for dry periods later on and water as appropriate. Summer - Best avoided if possible. Dry periods spell problems or much effort and a high water bill. High temperatures means that the grass stops growing. Autumn - Best of all. Cooler days but not too cool means the grass grows well, usually dampish so less need to water and the grass is less likely to be walked on. Beware meadow turf. 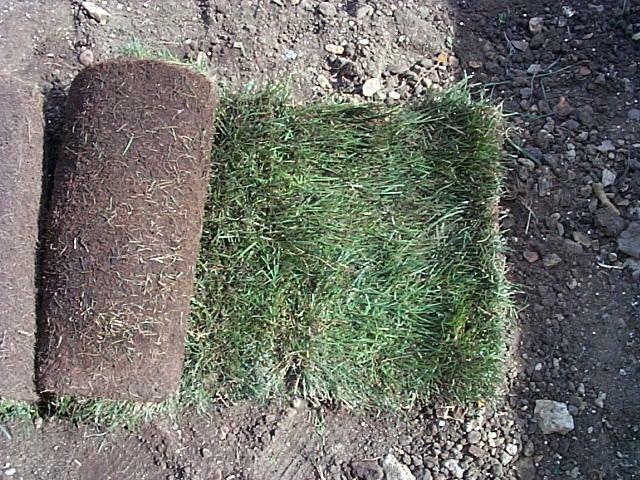 You may be offered turf that seems significantly cheaper than from other sources. The chances are that this will be "meadow turf". This is grass that has been growing in a field some-where, not initially intended for lawns, and is then lifted and sold. It will often contain weeds and coarse wild grasses. It can be used, but is really "spoiling the ship for a ha'peth of tar". 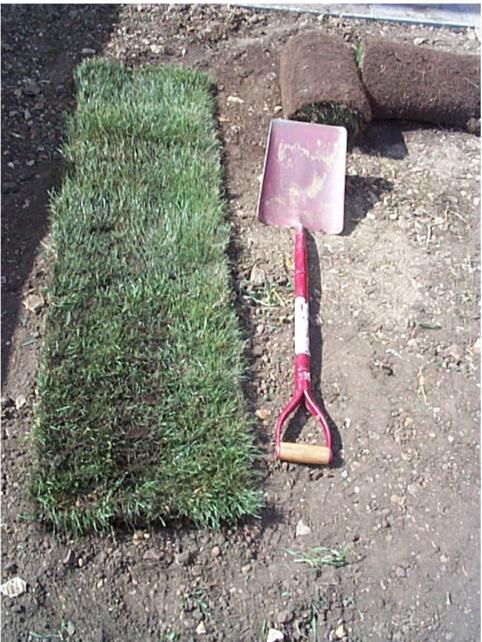 Make sure you buy cultivated turf that has been grown as a crop specifically for lifting and laying, it will be on good soil, weed free and have the right kinds of grass species in it. For most situations standard "Amenity grade turf" is more than adequate, this is not bowling green and it isn't rough grassland. It looks good with a modicum of care and will withstand reasonable amounts of trampling by the feet of both people and pets. Make sure you ask before you buy, and beware bargains! The starting point for your turf laying may be very uninspiring, particularly if the property is new and turf is not provided as in these pictures. Remove particularly large stones by hand initially so as not to damage the rotavator blades. Here a small rotavator is being used to loosen larger weeds to help their removal. Perennial weeds are best dug up, cutting off the top-growth may leave the roots which will then grow again through the new turf. The next job is to rotavate the whole area. The larger the rotavator, the quicker it will be. 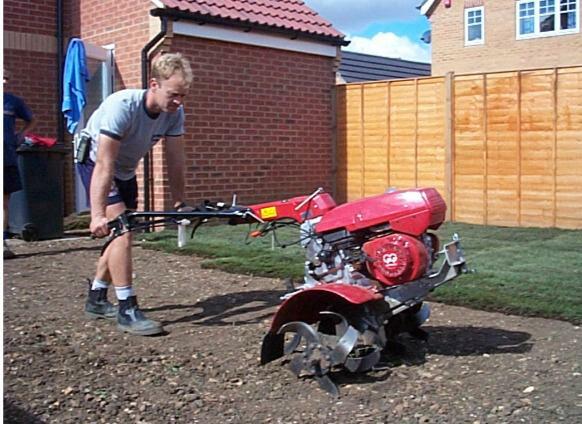 Rotavators are available from tool hire shops, who will often deliver and collect. Do not underestimate the effort involved in controlling one of these machines, particularly in manoeuvring around a small garden. Depending on the state of the soil, two or three circuits should be enough. Smaller machines are available and are lighter to control, but will obviously take longer to do the same job. Turves are rolled out in position. Start at a straight edge and stagger the joints. Order about 5% more turf than the area you are covering to allow for wastage at cut edges. A final rolling helps to smooth the finish and ensure that the underside of the turves are in contact with the soil so that the roots can grow. Give a good watering with a hose at this point. Two weeks on the result is a vibrant green lawn. The edges of individual turves can be made out, but very shortly everything will blend in. If there is a dry spell, the lawn will need to be watered every few days for the first month or so. A good soak twice a week is better than a daily dribble. The lawn should not be walked on for at least two weeks as not to damage the fine newly developing grass roots as they grow out of the turf into the soil below. If there are gaps between the turves, then fill in using a mix of sand and peat, the grass will soon knit across the top. Q. Can I lay turf on top of my old turf as I am just raising the garden up a little. A. Possibly but I wouldn't risk it. The old turf would rot away by turf-rotting fungi which could then well attack the new turf. Also the new turf wouldn't be properly rooted into soil, but onto dying turf and could well struggle and die itself for this reason. You need to rotavate and remove the old turf, or weed kill it and then remove the remains before leveling the soil - possibly adding more topsoil - and then relaying the new turf. With turf at several hundred pounds for even an average garden with a lot of work too, I wouldn't even think about risking it. 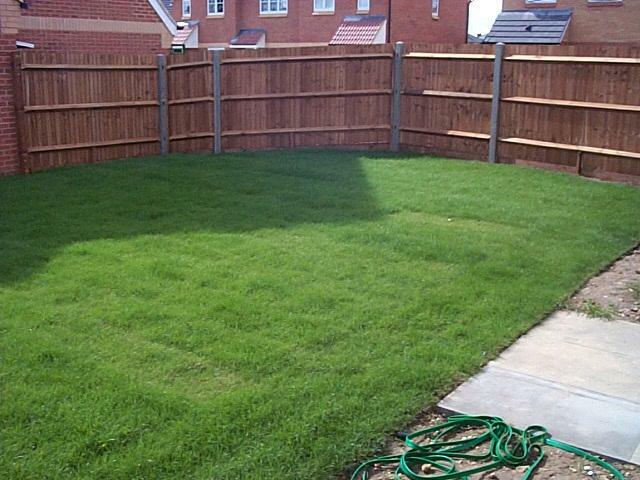 Q. I have a front lawn approx 20m2, it is very uneven and weedy and I wish to level it to suit surrounding drive and paths. 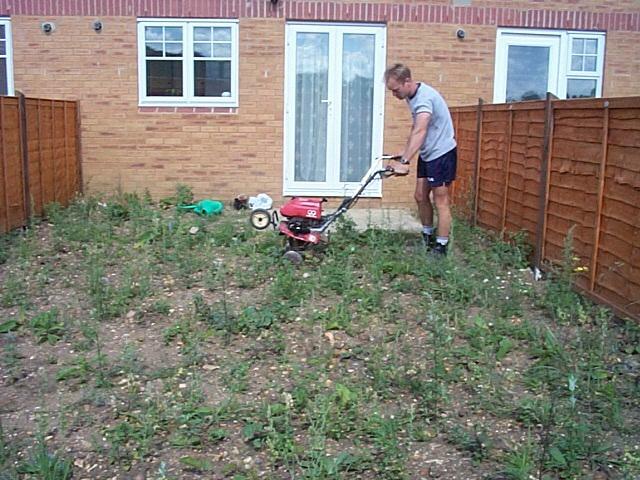 Am I better leveling the current lawn and turfing over or killing the grass, leveling and turfing. There are no other plant within the area yet as all were removed at the end of last season, ready to start a fresh this year. A. You can't beat a clean start, clear the area, level and re-turf. Anything else, you will be forever tinkering around here and there with a second rate result. Q. I laid a new turf lawn approximately 2 weeks ago. We made sure the ground was level and free from any stones or weeds etc. The grass seems to have taken well but the ground has become very lumpy. Is there anything I can do about this? Should I use a roller and if so under what conditions. A. A lot of what has happened is probably just due to the fact that when the turf roots meet the soil they partly penetrate and partly push upwards, so you get a slightly floating turf effect for a while. 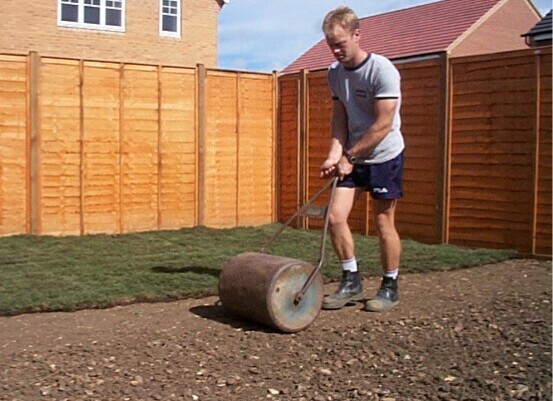 This will settle down though can be helped, not so much with a roller as with a lawnmower with a roller (they're not as heavy!). In addition to this you may have some areas settling differentially to others (also probably some grass areas growing faster than others and giving an effect of lumpiness). I'd leave well alone for a while before trying anything drastic, if after a couple of months, there is still lumpiness, then try the following question down. Q. On holiday in Thailand, I noticed that the hotel lawn wasn't really like grass at all but a sort of plant - wide dwarf leaves, no flowers as far as I could see and very tough to walk on. Is there an equivalent no-maintenance UK option that my kids could run around on? A. The grass you saw was probably "Bermuda Grass" a tough tropical plant that is the best that can be managed outside of the temperate regions without a lot of care. It might appear to be tough, but isn't, it can't take a lot of traffic. We had a similar grass in Mombasa, Kenya, when I lived there, it's also not very pleasant to touch and doesn't form the best play surface. Standard temperate grasses are far better, they grow more quickly with less care, are softer and more pleasant to touch and rejuvenate better after cutting and wear. If anything, people who live in the tropics would far rather be able to grow temperate grasses. If you are looking for a hard-wearing grass, then select one with rye-grass, you will sacrifice fineness in the process and need to have a rotary mower to deal with the stalks that stick up persistently when you mow it, but it's the best bet in the long run. Q. I am looking for a very tough resilient plant that I can use in place of grass. I would like it to be soft enough to sit on but tough enough to look good after it has been sat/walked on. I have been looking at moss and heather as alternatives to grass. I'm not fussy as to how it looks, but I'd like it to completely cover the ground and as I said be tough. I saw some weeds in Thailand grown in place of grass that looked promising. A. The only thing that fits the bill is grass - that's why it's used. Other things are used in the tropics as they can't grow our tough/soft/resilient/quick-growing grass there in that climate - and the alternatives they use aren't as tough. Moss is too fragile and can't take much wear. The best bet is a tough resilient grass seed, you can also get "meadow turf" that is basically turf with tough weeds already in it. There are also plastic sheet products that can be laid to add resilience to areas that are driven on for instance.